1, Combined by 3 parts which can be separated and put together, with protect case outside. 2, Portable, easy to carry for international travel to countries like: Germany, France, UK, Spain, Italy, Greece, Netherland, Finland, Norway, Sweden, Switzerland, Denmark, Austria, Portugal, Poland, Czech, Slovakia, Ukraine, Estonia, Latvia, Lithuania, Malta, Bulgaria, Romania, Slovenia, Croatia Bosnia; China, Japan, Korea, HK, Turkey, India, Pakistan, Singapore, Malaysia, Indonesia, Thailand, Vietnam, Philippine, Saudi Arabia, Qatar, UAE; USA, Canada, Mexico, Brazil, Argentina, Peru, Colombia, Venezuela, Bolivia, Paraguay, Uruguay and other140 more countries. 3, Flame-retardant material; safe to use. 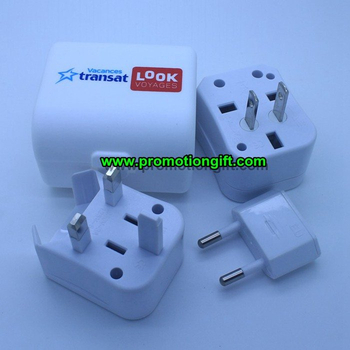 4, Plain area for printing, serve as good gift for Bank, Travel Agent, Hotel and so on.